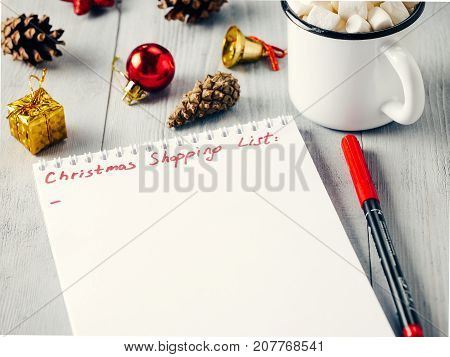 mug › Buy Poster of Christmas gifts shopping planning. Make shopping or to-do list for Christmas. Notebook, mug hot chocolate with marshmallows, New Year's decoration and pine cone on gray wooden background. Poster of Christmas gifts shopping planning. Make shopping or to-do list for Christmas. Notebook, mug hot chocolate with marshmallows, New Year's decoration and pine cone on gray wooden background.